A simple green potato salad dish straight from the garden plot to the plate. Yes I am proud to boast that all the ingredients have come from my garden. New potatoes, fresh mint, spring onions and broad beans finished off with a light olive oil dressing seasoned with salt and pepper. Simple. So there is no real recipe to share here, you just have to make it to taste and tuck in with a fork. 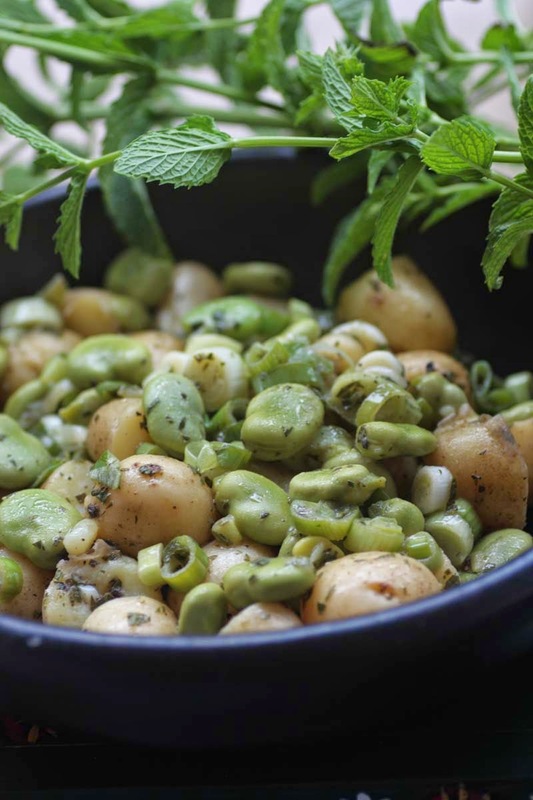 I am sharing this simple minted broad bean potato salad with Jacqueline of Tinned Tomatoes and Lisa from Lisa's Vegetarian Kitchen for this months No Croutons Required. What a simple but tasty salad - just how salads should be. 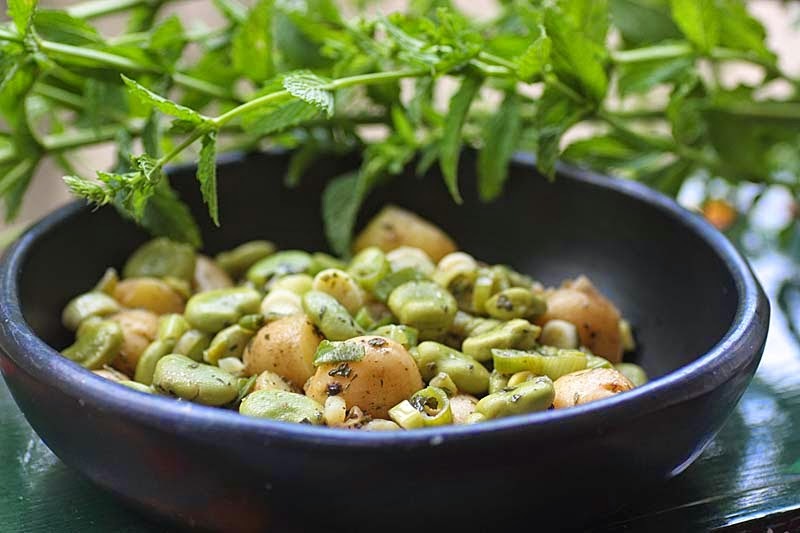 - I have never had broad beans with new pots but I am going to try this, thank you. Thanks Lorna. Hope you enjoy when you do. That one is a definite winner! Your Broad Beans are very late. What variety are they? Thanks Mark. Everything has been slow in my garden, they are masterpiece Broad beans, I still have some to harvest tomorrow, probably the last of the season. Mmmmm, I can't think of anything more wonderful Shaheen. 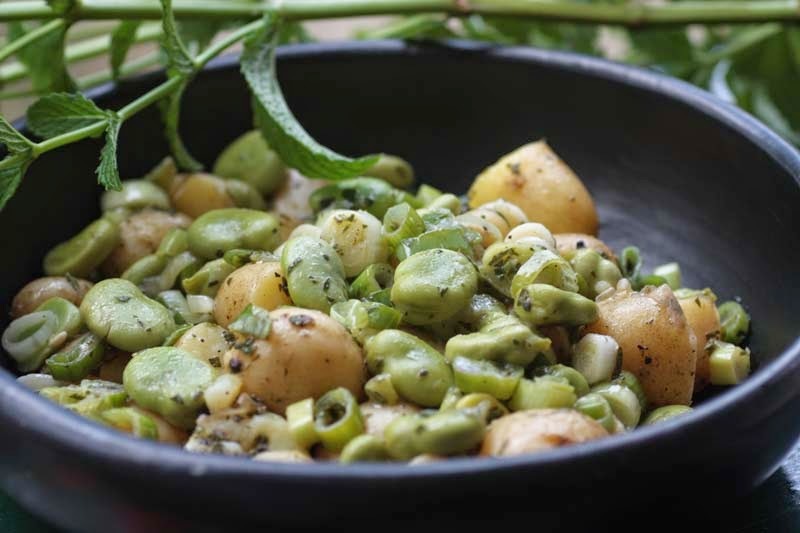 I love potatoes and broad beans. Thanks for entering it into this month's No Croutons Required. The roundup is now live. Thanks Jacqueline, lovely while the broad beans lasted.